To the right of the entrance to my house stands a distinctly ragged old tree. The tree hangs limply for two thirds of the year until it starts to stir around February. A brilliant golden bulb starts to peek out from under its previously harsh exterior and by the beginning of March, the tree is flecked with gold. It starts to shed this gold almost immediately, leaving the effect of a just missed confetti shower around my driveway. In November 2015, I attended a reading from Jonathan Franzen in Dublin. Franzen was on something of a mammoth promotional tour for Purity — his fifth and possibly most polarizing novel. After the reading and a standard interview, the floor was opened up for questions. One attendee asked him to relay a story about him once pointing out a beautiful bird to the late David Foster Wallace. He was visibly irritated by the question and batted it away. 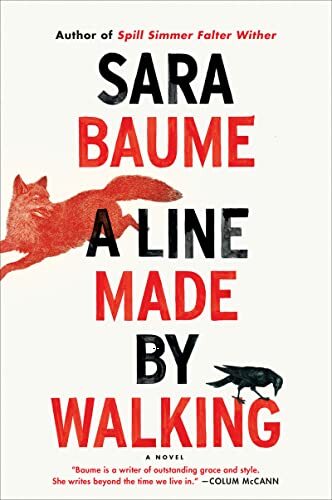 The objects and passions which sustain us are not the immediate subject of Sara Baume’s A Line Made By Walking. It begins with an explanation of how narrator Frankie’s grandmother died. A passing in the night, notable for the storm that uprooted a nearby tree. Frankie takes a branch of this tree and says she loves it for marking her grandmother’s death. She goes to live in her grandmother’s house and begins a project of photographing dead animals. She establishes some rules for this project: she must not be involved in their death in any way and she cannot photograph any creature that is merely wounded. The novel is marked by her photos of these creatures — a badger, a rabbit, a rat, a robin — and they become her documentation of a world that is dying around her. Early during her stay, Frankie comes across a number of “weird” trinkets that her mother has deemed to be sufficiently important to save from a clear out. She wonders what it is about these nondescript items that moved her mother to make such a decision. Why a small Eiffel Tower or a “wobble legged beetle in a nutshell” was worthy of keeping. Were they infused with her grandmothers gaze she asks? Was it because they kept her company during her final weeks? That they may have some sentimental value — some cliched idea of worth because of circumstance — never occurs to her. Aside from her photographs of dead animals, the novel is punctuated by the narrator testing herself on all manner of art projects. “Works about running, I test myself;” “Works about bed, I test myself;” “Works about flowers, I test myself;” — in every instance Frankie displays almost total recall of the detail behind a particular art project and her interpretation of it. We are left with the impression of someone who believes they have failed at art and needs to test themselves in order to keep some idea of a passion alive. There is a regret about art here — that it could not sustain her. It could not facilitate her manageable discontents. The fingerprints and shadow of Frankie’s grandmother stalk the house, from the smell of her now dead dog to the creaks and murmurs of a house in disrepair, its loyalties still lie with its old occupant and Frankie is drawn to this. She is drawn to living in someone else’s world, of sustaining someone else’s life. Throughout the novel, Frankie remembers various episodes from her childhood. One such episode details a wheelchair bound friend in school who suffers a fall. She wails and screams and continues even when she has been picked up. Frankie equates this screaming with the girl’s realization of all of the “cumulative indignity of every compromised school day gone by and yet to come, by the weeks after weeks after weeks of unspeakable unfairness which would not stop, not ever.” The girl’s façade of strength evaporates and we are led into her horror — for Frankie, the scream is never about one incident, it’s about all of the incidents to come. All of the dead things that will lie around her. A Line Made by Walking has the unusual quality of documenting Frankie’s descent into depression and yet celebrating aspects of life taken for granted. By its end, Frankie is continuing her journey and cannot offer us any real kind of resolution, she is just going to keep moving. She is going to keep testing herself and hope things will get better. Frankie’s tale reminds us that that gold confetti falls everywhere, we just need to see it and not merely look at it. But the book’s great power is helping us to better understand those who can only look. It helps us understand the difference between managed discontents and unimaginable misery. Paul Ring is a freelance writer in Ireland. His work can be seen on the Irish Examiner and The Irish Times. Rainer Maria Rilke once famously advised a young poet to live the questions. Rilke did not have Google. Culture’s conversation on technology tends to orbit around questions of responsibility and management: when is it rude to check our phones at dinner? Or, is it rude? Does social media intensify our loneliness? And Google, our stupidity? These questions are important and necessary; they aid us in the dailyness of living. However, Rilke’s advice concerns our desire to know, understand, and make sense of the world, and how we always find ourselves, in these efforts, more involved with mystery. It is maddening. And it is why we make art. In Changing the Subject: Art and Attention in the Internet Age Sven Birkerts wants to protect our fragile attention to mystery, which is relentlessly confronted by technology. “To pay attention, to attend. To be present, not merely in body — it is an action of the spirit,” he writes. “Art is a summoning of attention. To create it requires the highest directed focus, as does experiencing it.” If our attention is at stake — and that seems likely given the exponential demand on it — then art and imagination are equally at stake, Birkerts argues. The question is not whether checking your phone at dinner is rude (it is) but what’s lost in every moment we recede from the present into the plastic. In the mid-’90s Birkerts published The Gutenberg Elegies: The Fate of Reading in an Electronic Age to wide acclaim and serious skepticism. (Such are the sides of the technology debate.) By ruminating on the harmful influence of electronics and entertainment on imagination, Birkerts then named a culture preoccupied with certainty and productivity. And that was just the ’90s, when the Internet was in infancy and “personal device” likely conjured images of Walkmans not phones. I am increasingly haunted — I suspect many of us are — by a sense of being inadequate to the world around me. I often worry about the extent of my immersion. I keep telling myself that if only I could purge myself of competing thoughts and awarenesses and pay more attention to what is directly in front of me, I would be more alive. Technology has interposed a finely woven scrim of signals and distractions between me and my physically immediate reality. That many of these distractions are invisible only makes them more insidious, harder to navigate. Birkerts’s voice is not in isolation. Many lament the saturation of the digital into our physical living. There are studies on social media’s effect on our happiness and loneliness. Conversations on parenting methodology now include screen-time management. We bemoaningly utter the phrase “need to unplug” as if we’re addicts, or because we’re addicts. But it would be erroneous, negligent even, to frame Birkerts’s arguments as those of measurement. The essays of Changing the Subject — which vary from personal reflection to pointed cultural investigation — do not concern themselves with will and parameter but attention and desire. “There is clearly such a powerful, and, it seems, increasing, desire to be in touch — to express ourselves, to hear from others, to be caught up in that pulse that for a time eases our essential loneliness” writes Birkerts. There is so much anxiety in the drama of being human. Digital culture’s misguided attempts at scratching that existential itch only exacerbate the numb tickertape blurring of one moment into the next. We sense all this distraction delivered constantly through our devices and screens is not living. There exists no tune or harmony, only hunger and worry, to our digital behaviors. So, what’s lost? How will art suffer, that is, if it even survives? Imagination is a formative inward power, independent and generative. Information, by contrast, and by original definition, imparts inner form from the outside. To be informed is to receive the print of ideas or — and again I heed the etymology — impressions. Imagination creates shape; information imposes shape. Our struggle to make art is a good struggle — the use of the word “good” purposefully imposing an ethic — in all its demands on our attention, passion, and curiosity. Why do we go to art, as creators, engagers, or both? Does such creative drive have arbitrary origins, or could it be that art directly confronts our anxiety about being human? Are we trying to offer a digital balm to our angst? This is not accusation, but confession. I think on our urgency to photograph countless moments. Whether attempting to capture aesthetic or emotional gravitas — mountains or first steps — we long to hold what is too fleeting or too vast to hold. “I do think that when we have those occasional deeper moments, when we look up at the night sky and experience reverence, what we are experiencing is the power of the immense unknown.” And so, it is human and not adulteration to take the photo, but it does expose the charged, pregnant experience of finitude, and the craving for longevity and solidification. This longing drives us to art and expression or it drives us to distraction. Birkerts pleads the former. You wouldn’t expect the intricacies of Tudor baking, brewing, ploughing, cooking, needlework, painting, dancing, and card-playing to hold an audience rapt, and yet Goodman makes the minutia of everyday life a half-millennia ago tremendously interesting. This is less illustrative of “manageable discontents” vs “unimaginable misery” than it is of the snubbing of a midddlebrow sensibility and that middlebrow sensibility misinterpreting the snub as a (corny) parable. (Corny) parables being rather thick on the ground these days, since YA (however it wants to call itself) became the dominant commercial form of Lit.